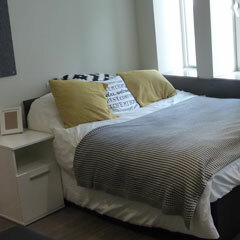 As an alternative to homestay accommodation, many Twin students prefer to choose a residential option. We offer a choice of accommodation at affordable prices where you can interact with fellow Twin students and make memories that will last a lifetime! Our Aldgate residence is in bustling Central London, so you can make the most of your time in the capital city. The residence features modern facilities with comfortable & spacious single rooms in addition to vast communal areas with sofas and dining spaces; plus you can benefit from free Wi-Fi which is available throughout the building. 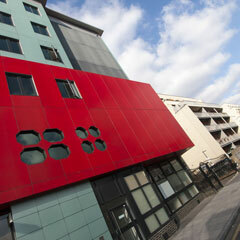 You will benefit from being part of a student community in a vibrant location. There are many places to socialise in the surrounding area, the residence is minutes away from The City and is just a short distance away from trendy Shoreditch. There are extensive transport links so that you can travel easily around London with both Aldgate East and Whitechapel station just a short walk away as well as a number of bus routes. 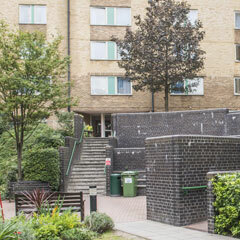 Located in a modern building in a vibrant area of East London, Bethnal Green Residence is perfect for students looking to stay in lively and comfortable self-catering accommodation, minutes away from excellent transport links to Central London. At this residence you will stay in a spacious and bright twin room in a studio flat, and you will share a fully-fitted kitchen and toilet between two rooms. You will have plenty of storage space, a big desk, a lamp and a notice board, and access to free Wi-Fi throughout the building. There are also fantastic communal facilities, which are ideal for relaxing and making new friends, including a modern internet room with free Wi-Fi in addition to a large common room with comfy sofas and a satellite TV. Bethnal Green Student Residence is just an eight-minute walk away from the nearest tube station, where you can reach the iconic Oxford Street in just seven stops! At this accommodation you will be able to fully explore all of the capital’s best attractions, and easily reach your language school or internship company. Located in a vibrant area of North West London, Twin’s Willesden Residence provides students with luxury self-catering accommodation just 10 minutes away from excellent transport links to Central London. 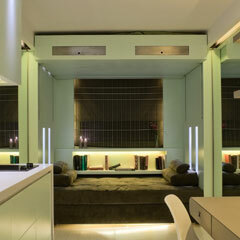 At this residence you will stay in superb en-suite studio rooms which have been finished to the highest quality. These rooms are all fully equipped with a bed, en-suite bathroom, plenty of storage and built in kitchenette with a cooker, sink and fridge freezer. Single rooms feature a double bed while twin rooms feature a bunk bed where the lower is a double bed and the upper is a single bed. This is the perfect residence for students who are looking to stay in top accommodation and experience a high level of independence while staying in London. Set within a gated complex on a residential street with 24-hour reception and security staff, this accommodation will provide you with a safe home from home environment. 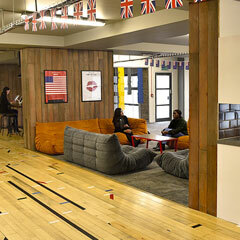 On-site you will also have access to a modern and trendy communal lounge area, a private courtyard and a café, which are all perfect for relaxing and meeting other students. Please note that twin studio prices are based on two students sharing. Situated in a vibrant area of South-West London (Zone 3), our Tooting Residence is ideal for any student staying in London. At this residence, you will stay in bright single rooms with access to a spacious communal kitchen in addition to relaxing living areas that feature a TV and pool room, free on-site gym and outdoor terrace. This residence is conveniently located close to the Tooting London underground tube station, where you will be able to easily access Central London in no time at all! 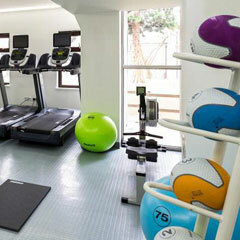 You will also be just a 4-minute walk away from local cafes and stores. Located a short distance away from the vibrant Charing Cross, Leicester Square and Oxford Circus, our King’s Cross residence offers students a comfortable place to stay as they enjoy life in the city. 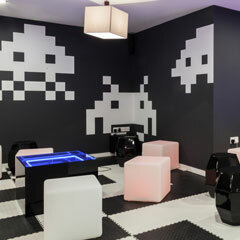 The residence provides a sociable environment featuring a common room with gaming facilities, table sports and a large TV screen for movie nights. The comfortable and spacious bedroom means that students have a place to focus on their studies whilst also exploring London. 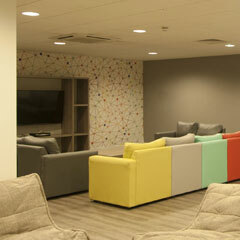 A large supermarket is located nearby along with a diverse choice of restaurants, a Vue cinema and an O2 Academy. King’s Cross St Pancras Underground Station is a few minutes away by foot, with an outside bus stop providing regular bus services to Camden Town’s famous market. There are many exciting museums and galleries nearby for students to explore via tube, including the famous National Portrait Gallery. With the Eurostar based in St Pancras International, residents can travel to France easily and access the rest of Europe during their holiday and weekend breaks. Startford, home to the famed Westfield Shopping Centre, is a busting area in East London which was used as a site for the 2012 London Olympics. From Stratford, you can gain a view of London's financial institutions that stand over Canary Wharf. You will not only be living near two shopping centres, including Westfield, but also next to a large park where you will find various attractions such as the ArcelorMittal Orbit, Aquatics Centre, London Stadium, Copper Box Arena, Queen Elizabeth Olympic Park and Wetlands Walk. You will be able to cross the River Lea through the park for a nice view. Stratford Residence features en-suite rooms with space to study as well as communal areas to go and socialise, providing you with the work and social life balance within your accommodation. Furthermore, Stratford's large station provides a variety of transport links to use including rail and the Underground network where you can use different lines including the DLR. Our modern style residence is within close proximity to the shopping area and the various famed attractions surrounding it such as the Cutty Sark, Greenwich Maritime Museum and Greenwich Market. The Meridian Line and Greenwich Observatory Museum is a walk up Greenwich Park, this is world famous for being the point in which the Greenwich Mean Time is based on. Central London is easily accessible via the DLR at Cutty Sark in addition to the train via Greenwich Rail Station. Greenwich has many restaurants and bars within the historical town, providing an environment in which you will be able to socialise and relax.